Lean Thinking: 7 Basic Quality Tools – Are they underrated? 7 Basic Quality Tools – Are they underrated? As I teach problem solving and observe people learning to problem solve according to the scientific method, I often see people struggling with the concepts of a hypothesis and the binary test of the hypothesis and with the rigor of the process. This is understandable as these are foreign concepts and new for most people. It’s very rewarding to see people change as they grasp the mechanics and begin to apply them and then achieve remarkable results. The strange thing I find is that people will all nod their heads and say they know how to use them but when asked to give examples in everyday situations they can’t. In fact, when pressed to use them in an actual problem, often they can’t. Many times I have to stop the problem solving and take a time out to have the group focus on learning the basic quality tools before they get back to working on the problem. Often they are seen as too simple. They must be easy to use. But like anything that looks easy, without practice and application, we never really learn how to use them. 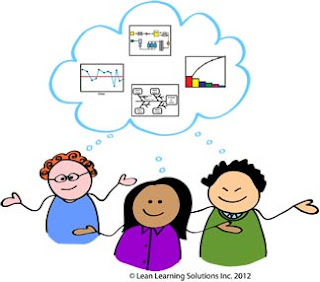 Lean is about thinking according to the scientific method. The scientific method is based on data. The 7 Basic Quality Tools allow us to organize and understand data so we can apply the scientific method. They make visible the data that is the backbone of good problem solving. Without them, we’re just throwing solutions at the wall and hoping something will stick. I believe every leader and every one working in a lean environment needs to be able to master these 7 Basic Quality Tools to the point where they can teach others. Evidence of their use should be easy to see in any organization.